In far-flung Seloto Village, Babati district, Manyara Region, Northern Tanzania, a trail-blazing farmer participating in the Africa RISING project shows researchers how farming system integration works. Farmer Andrea Mayi is successfully integrating crop, livestock, and tree farming in his 6-acre (4.2 hectares) farm consisting of 1.2 hectares (3 acres) each of crops and livestock farming systems, and a tree farm. Andrea, 58, who is also a village leader, is one of the early farmer-adopters of innovations introduced through Africa RISING. In a recent visit by the USAID and Africa RISING teams to research project sites in Babati and Kongwa districts, Tanzania, Africa RISING researchers showcased ongoing research in the different work packages and highlighted the work with selected farmers from several project intervention villages. Farmer Andrea practices a mixed intensive farming system that shows how to optimally merge crop growing and livestock production with tree farming. Every inch of his farm is used, with an area planted to crops that include maize, vegetables, and legumes, and trees; a space for raising pigs, goats, cattle, and chicken; and a tree farm that grows fuel and fodder wood species. From the animal manure he makes biogas that supplies energy for home cooking. Crop residues are fed to the livestock or composted to be added to the soil. 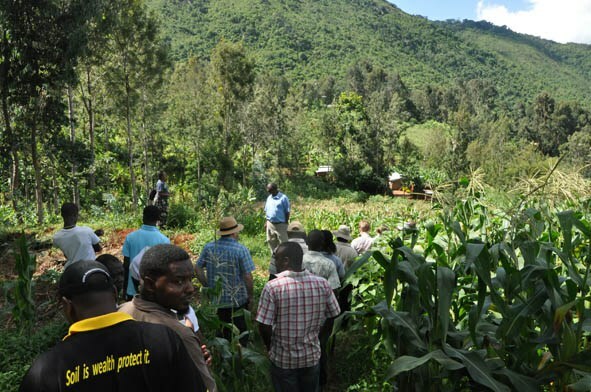 Andrea’s farm is only one of about 12 farmer trial sites in the two regions in Tanzania visited by the team. The USAID team was composed of Jerry Glover, Senior Sustainable Agricultural Systems Advisor, Office of Agriculture, Research & Policy, Bureau for Food Security; Laura Schreeg, Science and Technology Policy Fellow of the American Association for the Advancement of Science/USAID; and Elizabeth Maeda, Research and Production Advisor at USAID, Tanzania. The Africa RISING team was led by Irmgard Hoeschle-Zeledon, Coordinator of the West Africa and East and Southern Africa (ESA) components of the project, and Mateete Bekunda, Chief Scientist of ESA. IITA’s Deputy Director General for Research, Ylva Hillbur, also joined the visit. Farmers with scientists and researchers from IITA, other CGIAR centers, and partner organizations leading and working on the various work packages talked about their experiences and trial results. The visit provided the team an opportunity to interact with other farmers’ groups in the project sites in Seloto and Long Villages in Babati, and Chitego, Kibaigwa, and Laikala in Kongwa, and to see what was actually happening in farmer-installed and managed trials, and how the project is impacting farmers in the project sites. In one village visited, the women welcomed the team with a song in the local language praising the project and describing the benefits of participating in research activities. Farms visited showcased work being undertaken on Maize Lethal Necrosis Disease, postharvest handling and mycotoxin management, crop management efficiency, traditional postharvest storage system, climbing beans, fodders and feeds, maize-legume intercropping, vegetable and maize, pigeon pea, and livestock and water management. 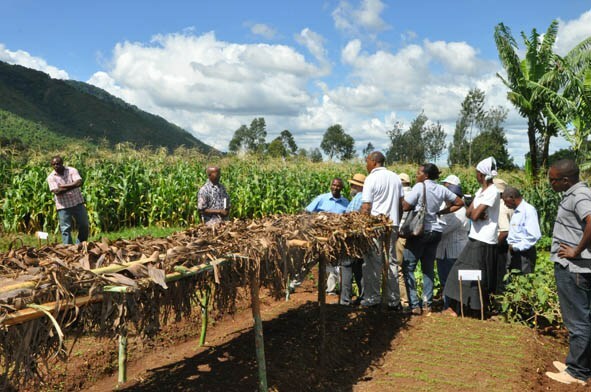 Andrea Mayi (middle, in light blue shirt) shows his vegetable flower bed where he is growing new improved varieties of vegetables following improved farming methods as trained by researchers under the Africa RISING initiative. Tags: africa rising, USAID. Bookmark the permalink.